Columbus Blue Jackets centre Pierre-Luc Dubois wants to strum a guitar as skillful as he can make a pass to one of his high-scoring linemates, Artemi Panarin and Cam Atkinson. Right now, however, the 20-year-old Dubois is fully committed to his career. The second-year forward wants to continue to improve, even though he enjoyed a 20-goal rookie campaign and his line has accounted for 28 of the Blue Jackets 71 goals through 21 games this fall. Hockey is in his DNA. There is a reason why Dubois wears sweater No. 18. His father, Eric, also sported the number for most of his playing career, including with the 1993-94 Atlanta Knights when they won an IHL Turner Cup championship. Before his time in Atlanta, where he met his wife, Eric played defence for five years of junior with the Laval Titan and won back-to-back QMJHL President’s Cups in 1988-89 and 1989-90. He then skated another dozen seasons of pro in the ECHL, AHL, CHL and IHL as well as in Europe. For the past 13 years, Eric has been a high-level coach. He’s in his third season with the AHL Manitoba Moose, a team he once played for. Eric and his son remain as close as possible despite being situated in two different time zones and in two different leagues. Pierre-Luc keeps an eye on how the Moose are doing and Eric closely watches the progress of his son. Eric always has been there with advice, whether it was during drives home from the rink when Pierre-Luc was a youngster or even in junior when the younger Dubois was with the Cape Breton Screaming Eagles and his Dad was an assistant coach with the rival Rimouski Oceanic. There was a time when Pierre-Luc wanted to play defence just like his dad. But the younger Dubois loved offence and jumped up into the play too much. So he became a forward for good. Still, because his Dad played defence, Pierre-Luc has benefitted because he’s considered a strong two-way player. “He always stressed the details of playing away without the puck and other important things like body position. It’s details that don’t show up in your statistics, but it’s details that help you win hockey games,” said Pierre-Luc, who is riding a five-game point streak with four goals and nine points during this impressive stretch. 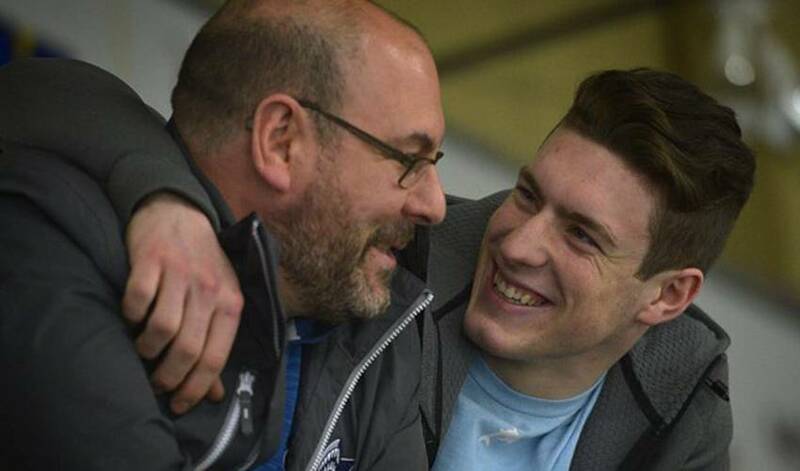 Pierre-Luc and his dad usually talk after every second game. Eric watches most of his son’s games live on television. But if the Moose are performing at the same time as the Blue Jackets he will tape Pierre-Luc’s games and watch his games in the morning. Pierre-Luc also relishes his trips with the Blue Jackets to Winnipeg. Last year, he visited with his parents the night before the Blue Jackets took on the Jets and they had an opportunity the next evening to watch Columbus score a 5-2 win.